On Monday, the Vineyard Gazette had a birthday, and on Tuesday it celebrated by inviting readers in to eat cake and hear from a few people who seldom see their names in print, but are critical to the creation of this newspaper each week. Stephen Durkee, director of graphics and design, Jane McTeigue, director of ad design, and Jeremy Smith, press supervisor, described to an eager audience the nuts and bolts of producing the print newspaper. 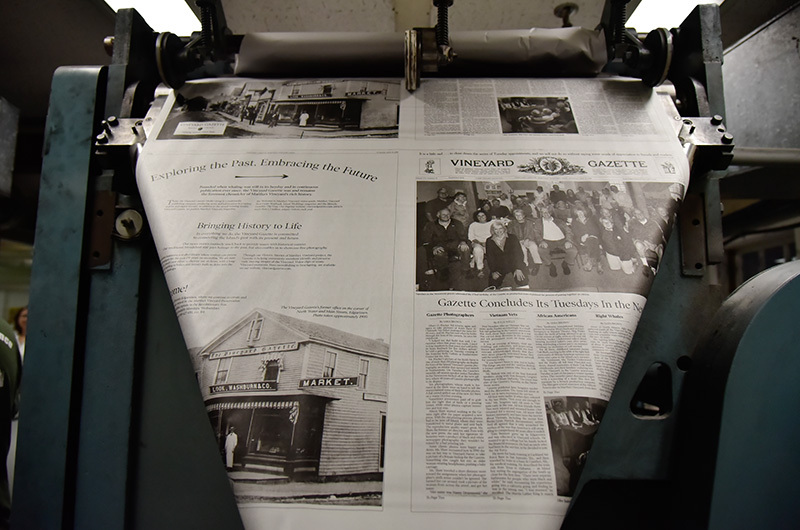 It was the final event of the season for the Gazette’s Tuesdays in the Newsroom series, and as a grand finale, attendees watched a special souvenir newspaper bearing their photograph on the front page roll off our 1974 Goss Community Press. After 172 years, much has changed at the Vineyard Gazette, but much has not. The Gazette remains one of the few true broadsheets in the nation, devoted solely to the interests of the six towns on the Island of Martha’s Vineyard, as we proudly proclaim on our flag. Community news is reported as it happens on our website at vineyardgazette.com, which is updated several times a day, all year long. But on Thursday nights, by time honored tradition, the print operation takes center stage, and the week’s best stories, advertisements from our partners and our signature black-and-white photography are combined, placed and packaged with the same care that has been taken for seventeeen decades. Thanks to the men and women whose very particular skills and commitment to quality make this newspaper both ageless and ever-changing. Because birthdays are a time to look back, we reprint what follows is a reflection about the Gazette from Henry Beetle Hough, the longtime publisher and editor of the newspaper, writing in his 1940 book Country Editor. Betty and I became editors and publishers of the Gazette in 1920, in the spring. We were young and we liked the smell of the old office upstairs over the grocery store. Once, for a year, I worked in New York for a corporation which had gross sales of almost a million dollars a day. The Gazette was everything which that was not. When we were ready to print an edition the next step was to go down into Main street and look for someone to turn the press. The press was operated by a large hand crank on one side, and a flywheel revolved with the crank to steady the uneven hand motion. It took more than an hour to turn off six hundred papers. There was usually a fisherman or some young man with a little spare time who would come in long enough for the press run, and there were one or two who had a good sense of timing and made the venerable machine run as slick as anything. Finally, to save lost time and bother, we employed by the week a young man named Grover who was a young Hercules for brawn and power but unfortunately handicapped by poor eyes so that he could not do most work. With Grover on the crank the press responded nobly and the whole building shook and went up and down. Everyone in the grocery story downstairs knew when the Gazette was coming out, and I never understood why they were willing to remain under that trembling ceiling. When we were to print an extra four page section, Grover would get down on the floor on his hands and knees and cut the paper for us with a big butcher knife, pulling and panting. Once or twice he cut himself and the anteroom was covered with gore. City people would come up the stairs to renew their subscriptions or advertise for lost spectacles, and they would see Grover on the floor, perhaps more or less blood smeared about, and all the other curious things, and their expressions were something to marvel at.